Make no mistake: We as a society are undergoing a cultural revolution. The population is growing evermore diverse. There is an incredible awareness of issues pertaining to race, class, gender and sexual orientation. Visit any college campus, and you will see that social justice is more than a value; it’s a lifestyle. Yet, if you were to look at the roster of lawyers at many law firms, you’d think it was still the 1980s. And while making diversity a part of your firm’s culture is a subjective matter, it makes business sense, especially as the business world is only bound to get increasingly diverse as the next generation – a more diverse generation – assumes control. But before we talk about where we as an industry would like to go, let’s look at where we are. I tried to find up-to-date diversity statistics on the American Bar Association website, and there are some great resources regarding women in the profession, particularly this almost-annual report titled “A Current Glance at Women in the Law." The most recent edition was published in May of this year. In private practice, women make up only 21.5 percent of partners. That’s only a 4.2 percent increase over 10 years. Numbers for associates and summer associates have remained stagnant over the last 10 years. Interestingly, and something that should be of concern to law firms, the growth rate of women as GCs in Fortune 500 companies is 7.4 percent over the last decade, reflecting that the business world is ahead of the legal world in terms of staffing female attorneys. That said, women as Fortune 500 GCs still only represent 24 percent of the profession. Despite the gender disparity in law firms, law schools are graduating women and men at nearly equal rates. In fact, 47.3 percent of J.D.s awarded these days are to women, a statistic that has stayed consistent for the past 10 years. For the most part, the percentage of minorities who are awarded J.D.s in the context of all J.D.s awarded has grown steadily over the years. For the academic year of 2012–2013, minorities made up 25.5 percent of all J.D.s awarded. Minority lawyers only make up 15 percent of Big Law. Of all employed lawyers, according to the U.S. Department of Labor, the racial breakdown is African-American, 4.6 percent; Asian,4.8 percent; and Latino/Hispanic, 5.1 percent. As you can see, there is a major disconnect between the overall population of the U.S. and the minority and gender breakdown in the legal industry. Furthermore, and perhaps more troubling, is the fact that the percentage of J.D.s awarded to women and minorities does not align with the number of female and minority attorneys employed at law firms. So while there’s certainly a large pool of women and minority lawyers, many law firms are not hiring them. There are two ways to look at the legal industry’s diversity problem. One is to see it as an issue of culture and values. I firmly believe that law firms should incorporate diversity into their core values and brand identities. I think providing opportunities for all – particularly historically disenfranchised communities – creates an overarching societal benefit. I also think people benefit from being immersed in a diverse environment, where different points of view and life experiences forge deeper bonds and facilitate greater empathy. That said, making a business case for diversity isn’t easy. According to a 2011 study by the Institute for Inclusion in the Legal Profession titled “The Business Case for Diversity: Reality or Wishful Thinking,” only 12.5 percent of corporate clients have sought to change their relationships with law firms based on poor performance against diversity metrics or objectives. Still, that was five years ago, and much has changed since then in terms of awareness of race and gender disparities. And generationally speaking, I predict that the current emphasis on gender and minority equity among younger individuals will have a great impact on the future of business relations and, therefore, law firms that don’t invest in diversity could fall behind their more diverse competitors. One more thought: If you are looking to invest in diversity for business purposes, your investment will fail if it doesn’t arise from that first point – the one about core values and culture. Tokenism is not diversity, but merely the appearance of diversity. Diversity runs deeper than the surface and is an element that should be interwoven into a law firm’s identity, should the firm wish to make diversity a value. So if diversity is a priority for a law firm, how can marketers play a role in cultivating a diverse staff of attorneys? The answer is branding and messaging. If a law firm has decided that diversity is a value and that it wants to prioritize that value, the firm needs to reflect that in the way it presents itself externally. This doesn’t mean an overhaul to the brand identity. It just means making room for messaging that speaks to the firm’s authentic commitment to diversity and the details of this commitment. When specifically addressing recruitment messaging, it’s important to note that different messages – as well as different ways of expressing messages – are needed to speak more effectively to various demographics, including women and minorities. And because knowing your audience is key to effective communications, consider getting assistance for your recruitment efforts from experts who reflect the demographics you are targeting. Write a subpage or subsection on the firm’s “About” page devoted to the firm’s commitment to diversity. Don’t just placate. Be authentic, and speak from the heart of your brand. Develop and promote a scholarship or internship program specifically for women and minorities. Create a section on your law firm’s LinkedIn page about your law firm’s commitment to diversity. Consider including statistics that reflect your law firm’s diversity efforts. Encourage your attorneys to attend and speak at events specifically for women and minority lawyers. These events are a good opportunity for networking, recruitment and PR. Open up your firm as a host for women and minority lawyer-related events. Oftentimes, female and minority lawyer organizations need spaces to host monthly meetings. Develop relationships with practitioners in these communities by donating a larger conference room a couple times a year. 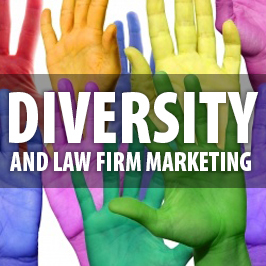 Want to learn more about how legal marketing can make an impact on a firm’s diversity efforts? Contact Terry M. Isner at tisner@jaffepr.com.